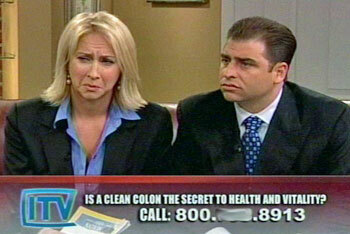 There is a brand new infomercial for the Almighty Cleanse infomercial being broadcast. “Health evangelist” Danny Vierra is back to gross you out with talk of the massive quantities of poop and parasites inhabiting the dark recesses of your colon. This is another program from ITV and Donald Barrett is again the host, but this time he is joined by co-host Chloe Marshall, the ditzy blonde who appeared on one of the Kevin Trudeau infomercials. Keep and eye out for it. Almighty Cleanse Video: Parasites Crawling Back to the "Cave"
“nation of constipation”. Not bad, but i like this rhyme, inspired be klee irwin “you dont need friends, you need a cleanse”. Donald Barrett is my hero; he does not even try to hide the cunning that shines through his eyes (Kevin Trudeau, in his reliable and Oscar-worthy performance, almost always looks innocent and sincere!). Whenever I see Donald Barrett on TV, his face reminds me of a fat wolf, while the image that comes to my mind while watching Dean Graziosi (another of my heroes) is that of a hungry fox. These guys have plenty of money and don’t have to do this. They are trying to inform people about crooked big pharma and doctors and this will hurt big pharma’s profits which could be 200 billion a year. They have pleny of reasons to silence these poeple. It will be a long time, before you lose billions. It will taker word of mouth and at least 20 more years to shut down big pharma, so you have plenyt mor eyears of profit. If they shut down the Internet these guys won’t be able to reach enough people to make a difference. Judging by the faces he makes during the prayer segments on The 700 Club every day, I’m going to say Pat Robertson is one of those 52%.